With support from Southwestern University, in addition to bursaries from the Society for the History of Authorship, Reading & Publishing (SHARP) and the Association for Computers and Humanities (ACH), I attended two exciting conferences over the course of July 2015: the Society for the History of Authorship, Reading & Publishing (SHARP) Conference, which took place July 7-10 at the Longueuil Campus of the University of Sherbrooke and McGill University in Montreal, Quebec, and the Keystone Digital Humanities Conference held July 22-24 at the University of Pennsylvania in Philadelphia. Highlights follow! My main takeaway from this conference was that digital projects in academic libraries interact in important, generative, and various ways with physical collections. It’s easy to think about digital projects in academic libraries such as the Provenance Online Project and the Book Traces Project as diverging from a tradition of librarianship stewarding material collections. In fact, as the Book Traces Project itself points out, the rise of the digital can threaten the existence of print collections. The project appeals to users to help identify unique copies of books with interesting ownership features (bookplates, striking marginalia) and inserted ephemera (locks of hair, dried flowers, personal notes, etc.) published between 1820 and 1923: “We need your help identifying them because many are in danger of being discarded as libraries go digital” (http://www.booktraces.org/). Many presentations at SHARP touched on the role digital projects play in preserving and enhancing access to physical books and material collections. For example, on the panel on which I presented, “Old Books and New Tricks: Regenerating the Library Visit,” Karla Nielsen, Curator at Columbia University Libraries, emphasized that the Book Traces Project ultimately exists in order to make a case for maintaining extensive print collections that include multiple copies and editions of a given text. Moreover, far from alienating student users from physical collections, the Book Traces Project in fact provides many students with their first exposure to the library stacks, since the project actively involves students in surveying areas of the stacks looking for items to digitize. Thus, the Book Traces digital project does crucial work to advocate print collections, demonstrate the value of retaining multiple editions, and promote student engagement with the rich materiality of these collections. Despite its identity as a digital project, the Book Traces Project ultimately makes a case not to replace print editions with digital surrogates. Over the course of my own panel as well as others such as “Generations of Readers: Appeals to Audiences and their Reactions Across Editions” and “Archive Accumulation : Antiquarian Affect and Obsolescence” I enjoyed learning useful tips and strategies for launching and running successful digital projects in libraries. For example, in order to engage faculty, it’s important to make very specific pitches, suggesting how particular library or archive items might figure in a course syllabus, and providing sample assignment prompts and assessment models. Gale Burrow of the Claremont Colleges Library provided great models on this front; see her highly adaptable series of exercises and prompts for her Early Modern Studies Primary Source Lab here. This conference blended long paper presentations with punchy digital project lightening talks. Keynote Miriam Posner‘s thoughtful talk, “What’s Next? : The Radical, Unrealized Potential of Digital Humanities,” encouraged digital humanists to frame projects that illuminate marginalized histories and perspectives, in a spirit of solidarity rather than charity. Posner referenced a tradition of ethics that holds the “gesture toward plenitude and contingency,” not the encompassing of these (which is impossible), as the ethical act. She pointed to The Knotted Line as a digital humanities project that embraces a non-linear, de-centered, deconstructivist approach in the service of one pressing humanities question: “how is freedom measured”? Goin’ North. This Omeka project, which involves contributions from graduate and undergraduate students at West Chester University, synthesizes oral histories and digitized regional archival materials to highlight narratives of the Great Migration of African Americans from the southeast to northern regions of the U.S. during the early decades of the twentieth century. Our Marathon. The Boston Bombing Digital Archive. Also an Omeka project, Our Marathon marshals images, videos, social media, and other digital primary sources responding to the Boston Marathon bombing. Doctor or Doctress? This project centers the unique perspectives of African American female physicians in order to examine U.S. history during the 19th and early 20th centuries. The Story of the Stuff. This web documentary examines the phenomenon where sites of devastating mass shootings–Sandy Hook Elementary School and Virginia Tech, for example–are flooded with “stuff” (teddy bears, paper cranes, cards, etc. ), thus creating impromptu, ephemeral memorial sites. College Women. This digital archives project documents the history of women in higher education through a focus on pertinent digital collections at the Seven Sisters. In addition to the multitude of fascinating panels and digital project showcases, I also enjoyed tours sponsored by the conference of the Library Company and the Historical Society of Pennsylvania, where we had the privilege of visiting the digitization lab. 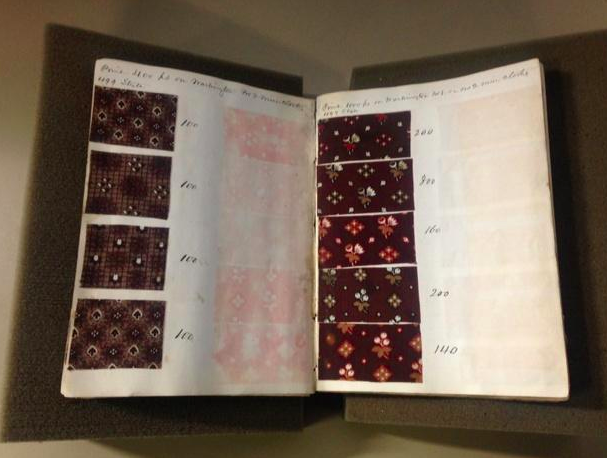 These 19th-century fabric samples archived at the Historical Society of Pennsylvania are being digitized for an online exhibit. The tours reaffirmed for me the very fun relationships among digital humanities, archives, and special collections. A big thank you to the organizers of the Keystone Digital Humanities Conference for their hard work on this hugely successful conference!